The week of October 16-20, 2017, schools around the country will be participating in National School Bus Safety Week. School administrators, teachers and local officials will be dedicated to spreading the word about how school bus safety is an important part of every school day. STOP ON RED is the theme for this year’s campaign and with the help of safety officials, we are hoping to make a significant difference in what people know about school bus safety. According to the National Highway Traffic Safety Administration (NHTSA), there were a total of 1,236 fatal school transportation-related accidents. This number accounted for 34% of the total 363,839 fatal crashes over this 10 year period. A school transportation-related crash is defined as a crash that involves, either directly or indirectly, a school bus vehicle or a non-school bus vehicle, functioning as a school bus, transporting children to or from school or a school-related activity. Sadly, an estimated 18 school-age children die each year in school-transportation related crashes and 6 of those deaths occur involving students while they are physically on a school bus. The other 12 deaths involve students who are pedestrians and are killed by school transportation vehicles or other vehicles involved in school bus-related accidents. These statistics are why “STOP ON RED” is such an important part of the educational and safety process. Children need to be reminded that the most dangerous area is 10 to 12 feet surrounding a school bus. 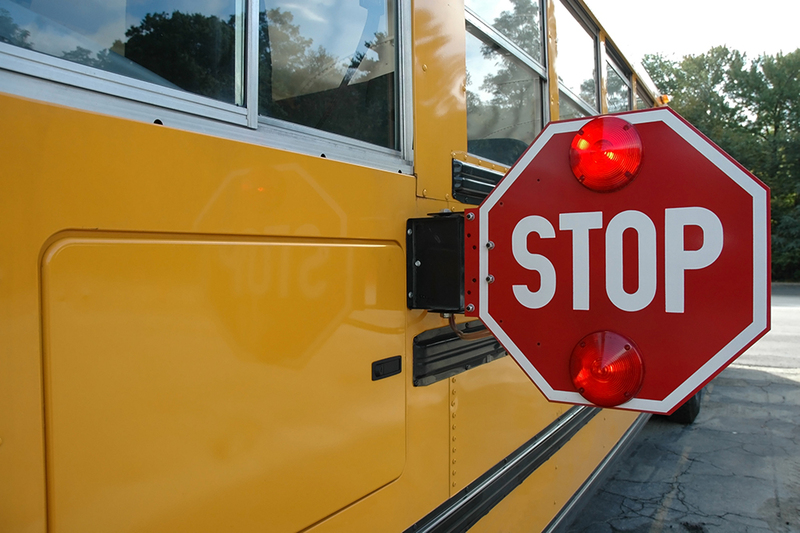 Oncoming traffic that is turning or choosing to ignore the “red stop sign” can cause collateral damage when a child is entering or exiting a school bus. Additionally, children need to be reminded to look before taking a step due to drivers ignoring and breaking the law. Why? Because 97,000 school bus drivers found more than 75,000 drivers illegally pass them while dropping off or picking up children in a single day!! With over 25 million children riding a school bus each day, it is important to not only educate our children, but we must also educate other drivers. Please join us in this discussion and follow the rules of the road near and around school zones and help prevent auto accidents.